DAYTONA BEACH, Fla. -- A horrific last-lap accident left drivers fearing for Austin Dillon's safety, muted Dale Earnhardt Jr.'s victory in the rain-delayed Coke Zero 400 at Daytona International Speedway, and left some fans in need of medical attention. Earnhardt crossed the finish line at 2:41 am Monday filled with dread after Dillon's car sailed upside down into the fence then shot back onto the track. The car was on its roof and mangled when it was hit hard by Brad Keselowski. The car tore down a section of fencing, debris scattered into the grandstands, and crew members from several teams raced to check on Dillon. Replays of the crash show parts of the car flying into the stands during the impact, reports CBS Orlando, Florida affiliate WKMG-TV. Daytona President Joie Chitwood said 13 fans were attended to in the grandstands. Eight declined treatment, four were seen at the track and one was taken to a local hospital in stable condition. None of the injuries was believed to be serious, and Dillon wound up walking away from the crash, WKMG says. Dillon was seen and released in Daytona's infield care center and said he had a bruised forearm and tailbone. Long before Dillon's fate was clear, a stunned Earnhardt seemed speechless as he crossed the finish line. "Oh my God. That looked awful," Earnhardt yelled into his radio. He followed with a string of expletives as he tried to comprehend the frightening accident. Crew chief Greg Ives immediately radioed his team to not pull Dillon from the car. "Whoever is in that window, if he's OK, do not touch him. Tell him to stay in there," Ives said. Earnhardt continued to inquire about Dillon, who earned his first career win at Daytona in Friday night's Xfinity Series race and has been close with the Earnhardt family his entire life. The late Dale Earnhardt won 34 races at Daytona and Dillon was present for many of them as he grew up watching The Intimidator drive for his grandfather, Richard Childress. Earnhardt was killed in a 2001 crash on the final lap of the Daytona 500. Earnhardt Jr. said after the race he had no idea who was in the car - it was torn nearly in half, its engine ripped from under the hood - but admitted to being genuinely scared after the wreck. "You are just on the verge of tears," Earnhardt said. "I saw everything in the mirror pretty clearly. ... I just was very scared for whoever that car was. I didn't care about anything except figuring out who was OK.
"The racing doesn't matter anymore." The outcome was never in doubt as Earnhardt dominated the entire race. But as the pack of cars chased him on a two-lap overtime sprint to the finish, contact in the train sent Dillon's car sailing upside down into the fence. 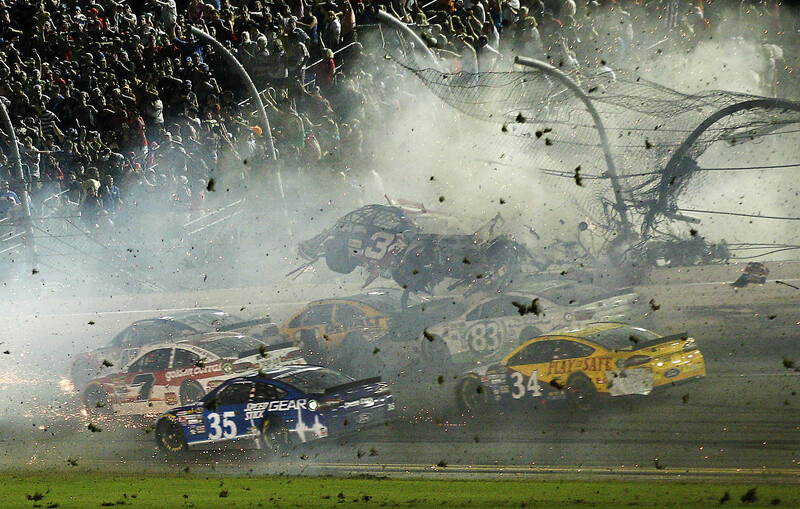 The accident was similar to a 2013 crash in the Xfinity Series when Kyle Larson's car sailed into the fence, sending debris into the stands that injured 28 fans. Larson's car was destroyed as it ricocheted back onto the track. Jimmie Johnson, who finished second to Hendrick Motorsports teammate Earnhardt, said Dillon's wreck was one of the worst he's ever seen. The accident overshadowed Earnhardt's second win of the season - his first was in May at Talladega - and his first in this race since 2001. It was his fourth Sprint Cup Series win at Daytona. The wreck was also the main focus at the end of a day that began early Sunday but quickly fell off schedule because of weather. The race began at 11:42 p.m., a delay of 3 hours, 34 minutes for rain. Drivers spent the time doing an array of different activities: Daytona 500 winner Joey Logano went into the stands to thank fans for sticking around, while Ricky Stenhouse Jr. used social media to prove he can do a headstand. When the race finally began, and the field circled the track waiting for the green flag, reigning NASCAR champion Kevin Harvick made note of the unusual start time by wishing his crew a good evening before correcting himself to morning. It then took just three laps for the action to begin as David Gilliland sliced across the front of Clint Bowyer to trigger a nine-car accident that collected Logano and Danica Patrick, among others. Tony Stewart, winner of the 2005 race that ended at 1:42 a.m., sliced his way through the carnage then grumbled on his radio about early-race aggressiveness. "Somebody please remind me how much Lap 2 pays again?" he smarted.